Posted 6/17/2016 7:22am by Cheryl Ferguson. Good Golly Miss Molly, we've got Gobs of Garlic! Sounds like a catchy song, eh? Well, it has been a part of our mental soundtrack this week as we have been moving through the harvest of garlic and shallots. To date, we have harvested 5,914 bulbs of garlic and about 200 pounds of French Red Shallots (from 1,406 plants)! This is the time of year when vampires give our farm an extra wide berth! And we haven't been alone in our harvest! We had a terrific group of volunteers come out to the farm on Tuesday to lend helping hands -- and it was great! We got the French Red shallots and Red Toch out of the ground - and even got it all stored in the barn! A HUGE thank you goes out to Jack Stack, Maggie Monteith and Sandy & Orville Woodard for coming out on a hot summer day! You make these tasks FUN! In addition to the garlic harvest, we were also trying to finish the hay. Check that one off the list, too! All of it is under shelter, be it square or round bales. And we are happy to report that our hay received a 5-hoof rating from the team of picky judges. We've also been getting more seeds in the ground -- our 2nd succession of beans has been planted and transplants of summer squash, cucumbers, ornamental corn and pumpkins are ready to get in the ground! We're starting to get color on the tomatoes in Raz House too - won't be long! 2016 Farm Tour - Just 1 Week Away! Things are really coming together for the 2nd Annual Northern Triad Farm Tour on Sunday, June 26 from 1-5 p.m. There are 7 farms on the tour -- we are all very different and focus on a wide variety of products. The other farms on this FREE tour include Borrowed Land Farm, Buffalo Creek Farm & Creamery, Minglewood Farm & Nature Preserve, Sanders Ridge Farm, Sungold Farm and Truffles NC at Keep Your Fork Farm. Check out this interactive map for details. We'll have lots of activities here: hayrides, music, farm stand, snowcones (with syrup from our berries! ), guided tours, kids' activities, meet the lambs and MORE! Mark your calendar and plan to head out to visit us and some of the other farms on the tour - it's gonna be a great day! And just a reminder: we are also looking for a few volunteers to help us with the event as well (greeters, parking helpers, photographer, set-up/take-down) so if you'd like to lend a hand, it would be greatly appreciated! We'll be at Cobblestone Farmers Market in Old Salem (Saturday) and King Farmers Market at the Stokes Family YMCA (Wednesday) with lots of Certified Organic tastiness including FRESH GARLIC, Garlic Scapes, NEW POTATOES, Artichokes, Baby Kale, full-sized kale bunches, Swiss Chard, Escarole, Salad Mix, Garlic Powder, decorative Allium Flowers, and Triple Crown Blackberry Plants. And you'd better hurry to snag one of the few remaining jars of Raspberry-Chipotle Molé! We hope to see you at Old Salem from 9-noon and King from 11-1. Please note that we may not always have every item at the Wednesday market. If you'd like us to save something for you, please send us an email by 10 p.m. prior to market. Happy Father's Day to all of you great Dads out there! Enjoy your special day -- kick your shoes off, prop up your feet and sip on a nice cold drink! It's YOUR day! And don't forget that we officially move into Summer on Monday with the Solstice --at 6:34 p.m. And this is a rare one as it occurs the same day as the Full Moon. This hasn't happened since 1948! Plum Granny Farm Weekly Update -- Let the Harvest Begin! Posted 6/10/2016 8:04am by Cheryl Ferguson. So much for those lazy, spring days (when WAS that?!) -- it's June and things are moving into overdrive. For some reason, we can never quite get things to sequence correctly so we end up with garlic harvest and hay making at the same time! Aargh! With this nice stretch of dry weather, Ray has been mowing our hay fields and we will start baling this afternoon. The grasses are really beautiful this year -- fescue, orchardgrass, lespedeza, clover -- and they combine to make a tasty mix that animals love. We have about 10 acres of hay -- and we are one of a handful of farms with Certified Organic hay -- so it is very much in demand. And there's something about haying that brings out the highest temperatures of the year -- upper 90's and even 100 degrees are predicted for this weekend and early next week! Whew! The good news is that our friend, Laura Pallavicini from Riverwood Therapeutic Riding Center will be getting a lot of the hay straight from the field. Thanks, Laura & crew! And if you see some soggy, sweaty folks over the weekend, be kind -- it may be us! On the garlic front, it seemed that in the blink of an eye, the garlic was ready to come out of the ground NOW! We always gauge readiness by the number of green leaves remaining on the stalk -- we aim to harvest at around 5 green leaves. Late last week, most plants had at least 7 or 8 and now, we have a lot that have very few green leaves remaining! How did that happen? We were very worried and started the harvest yesterday with Inchelium Red expecting the worst. I am happy to report that we were pleasantly surprised -- the bulbs look good and have nice tight wrappers. Day #1 harvest yielded 1,980 bulbs -- 10% of the crop -- not a bad start. Yay! Speaking of garlic harvest, it's time for a Crop Mob! We need some volunteers to help us harvest, trim and clean our bulbs of allium joy! We are tentatively planning a mob for Tuesday, June 14 starting at 8 a.m. Work ranges from picking up garlic in the field to sitting (under shade) trimming and cleaning bulbs. It really is a lot of fun -- and we'll treat you to lunch. Send us an email if you'd like to be part of the fun! We'll confirm the details with you then. Mark your calendar for Sunday, June 26 from 1-5 for the 2nd Annual Northern Triad Farm Tour! This is a great opportunity to visit not only our farm but 6 other farms in the region to learn a bit more about their operations -- learn where your food comes from and how it is grown! The other farms on this FREE tour include Borrowed Land Farm, Buffalo Creek Farm & Creamery, Minglewood Farm & Nature Preserve, Sanders Ridge Farm, Sungold Farm and Truffles NC at Keep Your Fork Farm. Check out this interactive map for details. And just a reminder: we are also looking for a few volunteers to help us with the event as well (greeters, parking helpers, set-up/take-down) so if you'd like to lend a hand, it would be greatly appreciated! We'll be at Cobblestone Farmers Market in Old Salem (Saturday) and King Farmers Market at the Stokes Family YMCA (Wednesday) with lots of Certified Organic tastiness including FRESH GARLIC, Garlic Scapes, Sugar Snap Peas (bunches! ), Baby Kale, Vates & Lacinato/Dino full-sized kale bunches, Swiss Chard, Frissé, French Red Shallot Flowers, Spring Onions, Salad Mix, Chives, Garlic Powder, decorative Allium Flowers, and Triple Crown Blackberry Plants. And you'd better hurry to snag one of the few remaining jars of Raspberry-Chipotle Molé! We hope to see you at Old Salem from 9-noon and King from 11-1. Please note that we may not always have every item at the Wednesday market. If you'd like us to save something for you, please send us an email by 10 p.m. prior to market. Folks frequently tell us that they enjoy the pictures in this newsletter -- thanks! If you'd like to see even more photos of Plum Granny Farm happenings, check us out at our Instagram account -- @plumgrannyfarm. We post several times a week - random pictures of farm life! Enjoy Iced Tea Day today -- with the predicted heat wave, it's important to stay hydrated & cool! 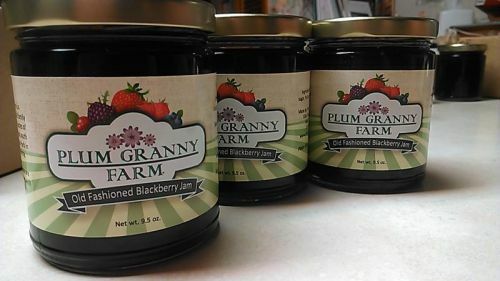 Plum Granny Farm Weekly Update -- Shear Delight! Posted 6/3/2016 11:47am by Cheryl Ferguson. As the temperatures have started to rise into the 90's, our minds have been on one thing: the very thick wool coats that BB and Tony have been wearing! So when Shearing Day rolled around, it was very exciting! But now we're not sure where our sheep went -- they look so different! And the lambs weren't not quite sure if they recognized each other either! The garlic finally started producing scapes in quantity -- today we harvested 67 pounds! And the asparagus got weeded and tucked in for its summer ferning -- see you next year! Mark your calendar for Sunday, June 26 from 1-5 for the 2nd Annual Northern Triad Farm Tour! We'll be joining 6 other farms for this terrific FREE event. More info to come but just wanted to make sure you got this date on your calendar! We are also looking for a few volunteers to help us with the event as well (greeters, parking helpers, set-up/take-down) so if you'd like to lend a hand, it would be greatly appreciated! We'll be at Cobblestone Farmers Market in Old Salem (Saturday) and King Farmers Market at the Stokes Family YMCA (Wednesday) with lots of Certified Organic tastiness including Garlic Scapes (plus recipes! 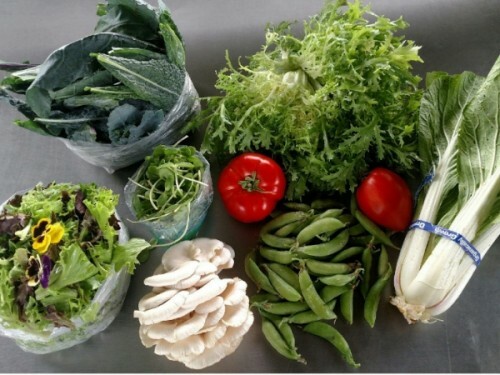 ), Baby Kale, Vates & Lacinato/Dino full-sized kale bunches, Swiss Chard, Frissé, French Red Shallot Flowers, Spring Onions, Salad Mix, Lemon Basil, Chives, Garlic Powder, and Triple Crown Blackberry Plants. And our jam and Raspberry-Chipotle Molé stocks are getting VERY low, so hurry! We hope to see you at Old Salem from 9-noon and King from 11-1. Please note that we may not always have every item at the Wednesday market. Interesting coincidence that the month designated as National Fresh Fruits and Vegetables Month also holds National Donut Day (today!). There's a great article by Tim Clodfelter in today's Winston-Salem Journal about the origins of the day in World War I. Enjoy your veggies with a side of donuts -- or whatever you wish! Posted 5/26/2016 12:14pm by Cheryl Ferguson. They're back! No matter what you call them, fireflies, lightning bugs -- they are back flittering over our yard and fields in the evening. What a wonderful sight! But I must confess... these little guys have been back for about a month now -- but I keep forgetting to mention it! Lots of sun and warmer temperatures this week -- and what does that mean? Weeds and irrigation! Getting the irrigation going after all of the rain we had has been a challenge. The pond pump was working fine before, but now there seems to be a problem. So what do you do? Get out the backup pump and cross your fingers. And then you find out that the housing is cracked on the backup pump so then you swap the housing... and cross your fingers! No wonder it feels like we can't get anything done! Irrigation or not, lots of plants are telling us that it won't be too long until it's their turn to shine! Raspberries, tomatoes and more are starting to show their colors! Won't be long! We had fun this past Sunday being part of the Competition Dining kickoff round in Winston-Salem! Our peas (snow and snap) along with carrots from The Specialty Farmer in Lincolnton and New Town Farm in Waxhaw provided the ingredients for Battle Peas and Carrots! It's always amazing to see what these talented chefs create out of the featured ingredients. Here's Cheryl with the giant gourmets from Team Phoenix of Brevard (left) and Team Miller Time of Graze Restaurant in Winston-Salem (right). Brix has a very good friend, Jenny Bates, who comes and visits her every week or so. Jenny (aka The Donkey Whisperer) quietly comes up for a visit and brings Brix a carrot, a bit of brushing, and lots of kind words of encouragement. We got to catch her in the act today! Brix really loves her friend. We'll be at Cobblestone Farmers Market in Old Salem (Saturday) and King Farmers Market at the Stokes Family YMCA (Wednesday) with lots of Certified Organic tastiness including Garlic Scapes, the last of the asparagus (limited quantity), Kale, Swiss Chard, Frissé, Pac Choy, Easter Egg Radishes, Chives, Garlic Powder and Granules, Triple Crown Blackberry Plants, and lots of transplants (tomato, tomatillo, herb). Our jam stocks are getting low, so you better make sure you don't miss out. And since grilling season is beginning, don't forget that our Raspberry-Chipotle Molé is perfect for grilled shrimp and meats! We hope to see you at Old Salem from 9-noon and King from 11-1. Please note that we may not always have every item at the Wednesday market. Wishing you the best on this Memorial Day weekend. The weekend always holds special meaning for us since both of our fathers served in World War II. Ray's dad, Bill, was a career Army man and also served in Korea. He was buried at Arlington National Cemetery. The photo below was taken during the Memorial Day weekend dedication of the World War II Memorial in 2004. Posted 5/19/2016 11:07am by Cheryl Ferguson. What a strange May this has been. Gloomy days seem to be the norm (although last Saturday at market was exquisite!). But the cloud cover and mist are good for planting and weeding, which are high on our to-do list this week. The weeds are definitely getting their spring growth spurt so we are trying to get them out of our plantings before they take over. The leeks are a good example. In the picture below, the unweeded bed is full of sedge and the newly weeded bed (to the right of Detroit) is nice and clean. Leeks, along with other alliums, don't compete well with weeds so it is especially important to keep ahead of the game. Another crop we are trying to tend extra well this year is potatoes. Last year the weeds jumped up before we could get in the field to hill and cultivate. In the battle between the weeds and the potatoes, the potatoes lost big time. And if the weeds didn't do them in, the Colorado Potato Beetles did. This week we scouted the field and found very few beetles or eggs (yay!) and Ray did another hilling and cultivation. Don't you think the field is looking mighty fine? One of the busiest "fields" on the farm is Raz House, our high tunnel. This little 30' x 40' space has a lot going on! The snow peas came out this week and the early sugar snap peas will probably follow today. The peas are being followed by tomatoes along with lettuce, basil and radishes. We are doing lots of inter-planting to maximize the space -- it's prime real estate! The picture below shows the newly planted tomatoes in the former snow pea bed -- behind it are the snap peas awaiting their final picking. We can really pack a house! The middle of May always signals one of our favorite times of the year -- Scape Season! Yes, our little acrobatic friends are starting to emerge in the hardneck garlic. These tasty morsels are always a frequently requested item at market -- and this week we'll have some! In addition, we are doing a cooking class on garlic scapes for Southern Home & Kitchen at Thruway Center next Tuesday (5/24) at 6 p.m. Contact them for reservations (336.777.3660) – it will be fun and tasty! On the Bee front, Ray completed the transition of the damaged hive to a top-bar hive and things seem to be doing okay -- it is still hard to tell if there is a queen. Later today, Ray will be installing a nuc from a swarm that our friend, Brian Hart, caught. His wife, Sharon, had read about us losing one of our hives and called to offer one of theirs. Those bees will be going into the Langstroth hive body -- trying again! Thanks to Brian and Sharon for sharing! Or was that hey day? The lambs and Brix were treated to a pre-haying feast of fresh grass this week. Freshly cut and delivered straight to their waiting mouths... sometimes you are just in the mood for fast food delivery! We'll be at Cobblestone Farmers Market in Old Salem (Saturday) and King Farmers Market at the Stokes Family YMCA (Wednesday) with lots of Certified Organic tastiness including Snow Peas, Garlic Scapes, Kale, Swiss Chard, Broccoli Raab, Frissé, Easter Egg Radishes, Garlic Powder and Granules, Triple Crown Blackberry Plants, and lots of transplants (tomato, tomatillo, herb). Our fruit-forward jams and Raspberry-Chipotle Molé will also be available. We hope to see you at Old Salem from 9-noon and King from 11-1. Please note that we may not always have every item at the Wednesday market. Tomorrow is Pick Strawberries Day. While we won't have any to pick, we want to thank everyone who came out to our PYO event last Sunday -- what a wonderful day! And thanks too to everyone who bought strawberries from us this year -- we know that we never had enough to go around but we really appreciate your enthusiasm for our little red fruits! Plum Granny Farm Weekly Update -- No Weather Drama! Posted 5/13/2016 7:58am by Cheryl Ferguson. We are so very happy to report that we have no cataclysmic weather events to share with you this week! Hooray! We got nervous yesterday evening when big, bad storm clouds started rolling in but they didn't bring us much of anything -- although it sounds like there was a lot of bad weather all around. Hope everyone made out okay. We really appreciate the well-wishes we have gotten from everyone regarding last week's storm damage. It means so much to get your words of encouragement and offers of help. We hope to be having a barn-raising event to rebuild the shed that collapsed -- don't know when that will be but you'll be the first to hear about it! The bees seem to have made it - although the numbers are reduced. We still aren't sure about the queen -- they have been a bit too grumpy to be able to get into the hive for a thorough look. We did have a little swarm on Sunday and were able to catch it. The swarm was from another hive -- not the one that was damaged. In addition to continuing storm clean-up, we've been getting some other stuff done around here. Amazingly the soil had dried out enough that Ray was able to cultivate the potatoes and hill them for the first time. Our little spuds are looking good! And the blackberries and raspberries are starting to develop green fruit -- promising! A good chunk of the week has been devoted to our annual Garlic-palooza -- our big order of spring garlic for The Produce Box. This year we had decided that we weren't going to do as large of an order (we've done as much as 5,000 bunches before!) so we initially thought we'd have about 300 or so. By the time we finished yesterday, we clocked in at 1,111! You just can't stop these guys! Kudos to our Rock Stars of the Palooza -- Chris & Andrew! You crushed it! Believe it or not, our strawberries have recovered and conditions are looking pretty good. So.... we are having a PYO on Sunday (5/15) from 1-3 p.m. We provide picking containers but please bring something to carry them home as well as a cooler. The berries are $3.75 per pound. Head on up to Stokes County on Sunday! It's supposed to be a beautiful day! We'll be at Cobblestone Farmers Market in Old Salem (Saturday) and King Farmers Market at the Stokes Family YMCA (Wednesday) with lots of Certified Organic tastiness including Sugar Snap Peas, Snow Peas, Kale, Garlic Powder and Granules, Triple Crown Blackberry Plants, lots of transplants (tomato, tomatillo, herb) and maybe some strawberries. We will also have our tasty jams and popular Raspberry-Chipotle Molé Sauce (it's grilling time!) We hope to see you at Old Salem from 9-noon and King from 11-1. Here's a bit of lore from our friends at The Old Farmer's Almanac: May 11, 12, and 13 are the feast days of Saints Mamertus, Pancras, and Gervais. These days are known as the Three Chilly Saints because they are traditionally the coldest of the month. English and French folklore (and later American) held that these days would bring a late frost. In Germany, they were called the Icemanner, or Icemen Days, and people believed it was never safe to plant until the Icemen were gone. Another bit of folklore claimed, "Who shears his sheep before St. Gervatius's Day loves more his wool than his sheep." BB and Tony are glad that we love them more than their wool! But the time to shear is soon! Have a great Friday the 13th -- did you know this is the only one this year? Posted 5/5/2016 1:30pm by Cheryl Ferguson. Hello Farm Friends! Happy Thursday! And Happy Cinco de Mayo! Or maybe that should be Happy Soggy de Mayo! We've got a soppy mess around here. To date, we've had nearly 5.25 inches of rain since last Wednesday. And unfortunately on Monday we had another brush with severe weather. Around 5 p.m., a downburst came through bringing crazy straight-line winds, hail and heavy rain. This storm didn't have the amount of hail that last week's did but the winds left us reeling. Of course, the strawberries got beat up some but the biggest losers were several large trees and part of the tobacco barn that we use for our packing shed. We've spent a lot of time this week cleaning up and trying to put things together while we see if the insurance company will help us rebuild the structure. Another victim of the storm was the newly installed beehive (the New-Bees). The force of the wind blew the hive apart. Ray went out on Monday night to try to rescue them and we aren't sure of the success of that mission. If the queen managed to stay with the comb that wasn't crushed, then there's a chance. Keep your fingers crossed for our girls! As you can imagine, all this rain and hail have not done the berries many favors. We have had to trash several hundred pounds and are trying to save what we can for jam. Today Chris and Andrew spent the rainy morning cutting up berries to freeze. Sorry to keep bringing you such downer news for two weeks in a row! But let's end on a positive note, shall we? We got lots of planting done, the garlic scapes are starting to peek through, and so many people have offered to help us with the clean-up. That's definitely something to smile about, don't you think? We'll be at Cobblestone Farmers Market in Old Salem (Saturday) and King Farmers Market at the Stokes Family YMCA (Wednesday) with lots of Certified Organic tastiness including Spring Garlic (Last week! ), Sugar Snap Peas, Snow Peas, Swiss Chard, Kale, Kentucky Colonel Spearmint (for Derby Day! ), Garlic Powder and Granules, Blackberry Plants, lots of transplants (tomato, tomatillo, herb) and Strawberry Hanging Baskets (with fruit!) We will also have our tasty jams and popular Raspberry-Chipotle Molé Sauce (it's grilling time!) We hope to see you at Old Salem from 9-noon and King from 11-1. Today is Ray & Cheryl's 32nd Wedding Anniversary! And our employee, Andrew Chandler, is getting married on Saturday! Happy times are here to stay! Plum Granny Farm Weekly Update -- Hail? Yeah!! Posted 4/29/2016 9:58am by Cheryl Ferguson. The past 24 hours have been a whirling dervish! What started as a calm, cloudy Thursday ended in a roar with a huge hailstorm and lots of rain. The storm packed a one-two punch and dumped 1.1 inches of rain in less than an hour along with the biggest hailstones I've ever seen here. The surge of water created some pretty serious erosion in the Flat Shoals field. Our other fields fared just fine. We have been working on stabilizing Flat Shoals for several years and have implemented erosion control practices to improve it. This was caused by a rookie plowing error that allowed the water to flow at a different (bad) angle -- oh, the things you need to know to farm! We've got to deal with this soon as we have more significant rain predicted over the next few days. Andrew had been planting beans in the field right before this hit -- we're not sure where those beans ended up! The good news is that we are all okay and there was no significant property damage. We just have some beat-up plants and fruit... We haven't started picking strawberries today but given the hail, we are sure that the fruit suffered damage. That will likely limit what we bring to market this week. Speaking of strawberries, did you know that strawberries are the #1 item on the Environmental Working Group's (EWG) Dirty Dozen? Conventionally grown strawberries are loaded with pesticides and the soil is fumigated with toxic gases. In a new report, the EWG cited data from California showing that in 2014, nearly 300 pounds of pesticides were applied to each acre of strawberries – an astonishing amount, compared to about five pounds of pesticides per acre of corn, which is considered a pesticide-intensive crop. So what should you do? Well, we know where you can get berries that don't have these issues! But we cannot supply the strawberry needs of our area -- our 2,000 plants are working hard but can't produce enough for everyone to get as many berries as she wants. When you explore other options, ask questions about the strawberries you buy. Learn about the growing practices: fumigants? pesticides? herbicides? Buying Certified Organic is your assurance that your food is safe but unfortunately there are not many local options. If you go to the other strawberry growers in our area, encourage them to adopt organic practices and seek certification. Customer pressure is a key reason for growers to make the switch to Certified Organic. The LaRatte fingerlings and other potatoes are really starting to pop up! Getting more beds shaped and covered has been a key task for the week. Since we are moving into warmer weather, we're using white plastic on the beds to keep the soil cooler than black plastic would. Our little orphan tomato plant is now very huge and has a permanent home in the greenhouse -- and is starting to produce RIPE fruit! We'll be at Cobblestone Farmers Market in Old Salem (Saturday) and King Farmers Market at the Stokes Family YMCA (Wednesday) with lots of Certified Organic tastiness including Spring Garlic, purple and green Asparagus (limited amounts), a limited supply of Organic & No-Spray Strawberries, Sugar Snap Peas, Snow Peas, Swiss Chard, Kale, Garlic Powder and Granules, Blackberry and Black Raspberry Plants, lots of transplants (tomato, veggie, herb) and Strawberry Hanging Baskets (with fruit!) We will also have our tasty jams and popular Raspberry-Chipotle Molé Sauce (it's grilling time!) We hope to see you at Old Salem from 9-noon and King from 11-1. Our planned Strawberry PYO on Sunday has been postponed due to the forecast of heavy rain & thunderstorms. Our current plan is to hold one on Sunday, May 8. Stay tuned! Posted 4/22/2016 8:49am by Cheryl Ferguson. Happy Earth Day everyone! As organic farmers, every day is Earth Day to us -- each action that we take is done with the intent of protecting our planet and its resources. We try to be good stewards of the Earth with everything we do. And we know you care as well -- by supporting a small, local and Certified Organic farm, you are making a statement and contributing to the health of the planet. With your purchasing decisions, you take positive steps to reduce our impact on the Earth. We thank you for your support and Mother Earth thanks you as well! The great news this week is that the strawberries have started coming in! They are coming in slowly but the crop is looking good (and tasting amazing!). We will have some at market this week and hope to have a pick-your-own event in early May. Watch this space! Or should I say, watch this busket! Here's your educational moment for today: the berry pictured below is deformed due to inadequate pollination -- enough bees weren't able to get to the flower to ensure even movement of the pollen to the female parts of the flower. Honeybees are the most efficient pollinators of strawberry plants -- and in this case, they were likely closed out of the field when it was covered due to the cold weather a couple of weeks ago. So by covering the plants, we lost some berries by excluding pollinators. See how important bees are? But you knew that! The week has been filled with lots of irrigation (it is amazingly dry for this time of year! ), seeding, planting, harvesting and getting the shade cloth on the greenhouse. This is the earliest we have put shade on the greenhouse -- and it felt like we were running late in getting it covered! This spring got suddenly hot and it was really impacting the plants inside! We had conveniently forgotten about the huge hole in the fabric so Ray had to do some fancy needlework (using a twist-tie for a needle!) before we could get the building covered. Who says farmers aren't Jacks (and Jills) of all trades? And lots of stuff is blooming -- from the lilacs to the fava beans to the blackberries! A HUGE thank you to everyone who came out to our Open Greenhouse & Plant Sale! Wow! What a great day -- and we even got some news coverage!! Despite an overwhelming turnout, we still have lots of plants left and we'll be bringing them to market this week. We'll be at Cobblestone Farmers Market in Old Salem (Saturday) and King Farmers Market at the Stokes Family YMCA (Wednesday) with lots of Certified Organic tastiness including spring garlic, purple and green asparagus (limited amounts), a limited supply of Organic & No-Spray Strawberries, swiss chard, kale, garlic powder and granules, Blackberry and Black Raspberry plants, tomato & herb transplants, and strawberry hanging baskets! And we will also have lovely irises and delectable jam! We hope to see you at Old Salem from 9-noon and King from 11-1. Quick Schedule Update: We are postponing our Turmeric Workshop scheduled for May 1 to a later date (TBD). We will likely have a PYO that day instead. Enjoy the Full Pink Moon which appeared at 1:24 a.m. today. It is the smallest Full Moon of the year, as the Earth and Moon move to their furthest points from each other. Posted 4/15/2016 9:24am by Cheryl Ferguson. Today is that magical day that gardeners look forward to -- no, not Tax Day -- Frost-Free Day! This is the day that everyone sets as the day that it is okay to plant out frost-sensitive plants such as tomatoes and peppers. What gets forgotten is that April 15 is the average frost-free date, not the absolute frost-free date. Since it's an average, there's is a 50% chance that we may get some freezes before we move into consistently warmer weather. Having said that, the long range forecast shows the weather through the end of the month as looking pretty warm. But it's always a good idea to give your transplants a chance to get used to being outside before planting. And be prepared for a cold snap. Old-timers always said that May 10 was the best date to be sure. This will be a great weekend to get transplants and get your garden ready to go. 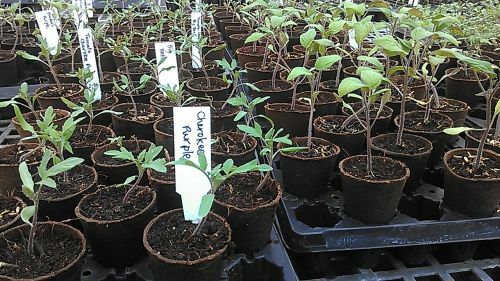 We'll have some tomato plants and strawberry hanging baskets at Cobblestone Farmers Market but will have most of our plants at our on-farm Open Greenhouse and Plant Sale on Sunday (4/17) from 1-5 p.m. We'll have hundreds of tomatoes, tomatillos, peppers, herbs, kale, and chard transplants along with blackberry and black raspberry plants and strawberry hanging baskets -- all Certified Organic! We'll also have soil amendments and some fresh veggies. This week we finally got the potatoes planted -- nearly 500 pounds of spud heaven!! The first step is to cut the seed potatoes into smaller pieces -- and boy, we sure got some lunkers this year! Chris and Andrew have fun racing each other to see who can finish planting a row first and they have turned laying out the driptape into a competitive sporting event! It's Team Plum Granny Spring Training! They planted 3,000 feet of potatoes (15 rows) and hopefully, we'll be harvesting about 3,500 pounds of potato-y deliciousness starting in late June! Thanks to all of you who braved last Saturday's less than ideal conditions for the opening of the Cobblestone Farmers Market in Old Salem! We didn't completely blow away (but our tent collapsed!). We'll be back this week in our repaired purple tent packed with lots of Certified Organic tastiness including spring garlic, purple and green asparagus (limited amounts), swiss chard, kale, salad mix, red and green lettuce, Pink Beauty & White Icicle radishes, garlic powder and granules, tulips, heirloom tomato transplants, and strawberry hanging baskets! And we will also have lovely irises and delectable jam! We hope to see you there from 9-noon -- it's supposed to be a beautiful (and not windy) day. The King Farmers Market at the Stokes Family YMCA will open on Wednesday, April 20 at 11:00 am! The market has several new vendors this year and has moved to the lower parking lot at the Y. We should have the same items as are listed for the Cobblestone Market. We had a great time with our friends at Old Salem Museum and Gardens yesterday for our talk on growing small fruit. Thanks to Vonnie Hannah for the invitation and for making us feel so welcome! As I was walking to the greenhouse after we returned, I got a glimpse of why we love to grow berries -- seeing the first buds of blackberry flowers! Stay tuned, folks -- it won't be long!